Recorded by John Cubbin at Audio XL Studio, Steve Hillman at his studio, Richard & Simon Benjamin at home and Dai Rees at play. Richard would like to thank Dea, Owen, Joe, Simon, Patrick, Brian, Steve, Dai, Rob, Mr. Christie and Cousin Neil. Brian says a big thank-you to his family for their patience and support. He also wishes to thank the fine musicians that he currently works with, and all those from the earlier years too. Steve thanks Linda for her encouragement and patience to participate in the making of this album. “Alive and Well” had a lot of significance for me when I first got involved with its recording but even more so now that Linda has passed. Rob would like to thank: Agata Azzolina, David Baird, Mike Beck, John Breeze, Kevin Browne, Andy Cutty, David Groves, Chris Hargreaves, Bob Hamilton, David Morreale, Phil Perry, Adrian Polley, Jackie Robinson, Gary Santry, Neil Saunders, Martyn Smith, Mark Stickells, Andrew Tunstall and Ian White; all of whom lent their skills and talents to these songs over the years. 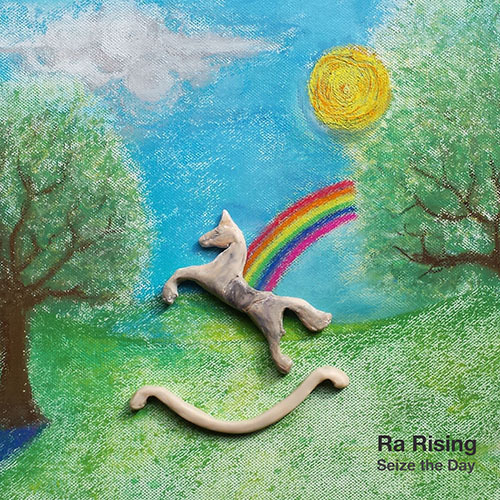 Ra Rising would like to thank Steve Bradley and David Gate for their invaluable help during the making of the album. A VERY BIG THANK YOU to Wallet and Grimace for funding the project. Take a cry, crash of hand. Look in the mirror do you like what you see? Where is the person you wanted to be? Is the image of one on which you could depend? If you met you today would you call you a friend? That was the time when I was most understood. Help us all to understand. Should I follow you to war? Holy Man, You raise your battle cry. You say our cause is right, whether we live or die. Holy Man, your acts have no defence. What am I doing here? This war it makes no sense! Can’t stop this feeling of hiraeth. Will it be so fine…again? Don’t want them growing out of turn…again. Why didn’t I see the single magpie on the lawn? Without your guidance where would I be? I’ll remember you alive and well. How many times will you stay? Do you not read the polls? What, who, why, how anyway? In the end it’s all just red clay—red clay. Or say something in a similar vein? How do I finish the task? But which auricle should I ask? Why didn’t you drive a stake through my heart? Why did I drop our future down in the dust? Vital not urgent for a life without worry. Walking by, my head held low, I’m a shoegazer don’t you know! Hear about the world’s blues, don’t care ’cause all I see is my shoes. Can you see the world through those shades you wear? Does it boost your ego when two people stare? Was all of this for real or was it just a game? Were we just pawns in your pocket when you passed the blame? The ones you’ve left had trusted you and thought you were on the run. You’re just a two bit hero. Why don’t you play with the kids on the sand? That his children are left alone again?